Rarely have a group of running backs been as bored as those suited out for Hobbs and Artesia Friday night at Bulldog Bowl. That’s, of course, tongue in cheek. 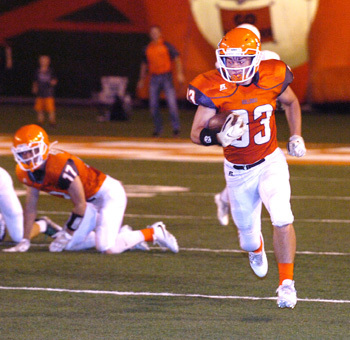 The Bulldogs and Eagles carried the ball around 20 times apiece in the contest, with Artesia RB Robert Fernandez making his presence felt with 109 rushing yards and three touchdowns. But for the majority of the night, what went on in the ‘Dogs’ 2017 home opener more closely resembled quidditch, as receivers and the defensive backs trying in vain to thwart them sailed through the air with a frequency outmatched only by the ball itself. It was the brand of football Artesia has long been known for. And unfortunately, Hobbs beat them at their own game. By the time the last of the bout’s 97 passing attempts came in for a landing, the Bulldogs and Eagles had combined for 105 points and more than 1,200 yards of offense. And although the ‘Dogs battled back to turn Hobbs’ once-comfortable lead into a one-touchdown affair with plenty of time left to tie, the boys in black and gold made their final – and by far their longest – drive count, securing the first downs they needed to run out the clock on a 56-49 decision. The ‘Dogs kicked things off Friday much the same way they did in their 34-0 shutout of Carlsbad Aug. 25, marching efficiently to the end zone on a mix of run and pass plays. Fernandez picked up the game’s first five yards, and junior back Jagger Donaghe followed with an 11-yard scamper. Two passes from Taylor Null to Chaney Hardt later, Artesia was at the Hobbs 12, and from there, Null’s offensive line gave him plenty of time to find AJ Estrada in the front corner of the end zone to make it 7-0 two minutes in. Hobbs, however, was nonplussed, firing their way quickly to the Artesia 40-yard line, from whence senior QB Gavin Hardison unleashed his first of six touchdown passes on the night, connecting with favorite target Alec Finney to tie things up in the same two-minute time span. The Bulldogs look poised for an immediate response, as a 28-yard pass from Null to Estrada helped propel Artesia to first and goal at the 10. But from there, Null was nabbed twice in the backfield, hauling the ‘Dogs back to the 14, and a field goal attempt sailed wide. 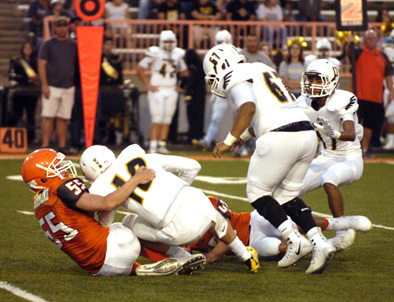 The Bulldog D stepped up to force an Eagle punt to give their offense a second stab at taking the lead, but Artesia went three and out, and Hobbs would earn that distinction in their next drive, scoring on a 64-yard bomb from Hardison to Finney. The ‘Dogs were able to reinstate the deadlock as the second quarter began, as Null thrice turned to Estrada to cover the distance from the Artesia 44 to the Hobbs nine, and Fernandez took it from there. The Eagles would again come through with a momentum-killer, however, as Hardison and Brenden Strickland delivered a 75-yard catch and run to make it 21-14 Hobbs with 9:05 to go in the half. A fumble on fourth down in the red zone left the ‘Dogs feeling even further out of sorts, but the Eagles missed a field goal of their own, leaving the door open for the bout’s third tie. An interception cut that effort short in costly fashion, though, and Hobbs needed just one play to score from the 12, as Hardison went over the 300-yard mark with a toss to Jaime Rivera. With help from a big 51-yard pass from Null to Alex Fernandez that rocketed Artesia to the Eagle three, the Bulldogs were able to move back within seven with 1:27 left in the quarter on a three-yard plunge by Robert Fernandez. But while that would be insufficient time for most teams to do any damage, it was plenty for Hobbs, who passed their way virtually unhindered from their own 13 to the Artesia 19 before Hardison and Finney sent their squad to the locker room with a 14-point lead, 35-21, despite the reception appearing to most to have occurred well out of bounds. When the Eagles headed back down the ramp and kept on going, scoring on a two-yard run by Tristan Kemp to make it 42-21, things could easily have gotten out of hand. But to the Bulldogs’ credit, they dug in their heels. “What I’m really proud of is that our guys battled from start to finish, and we got better as the game went on,” said Henderson. “Defensively, we came up with some stops in the second half that we weren’t getting in the first. And even when we didn’t stop them, we were getting them into third and long more often than we had earlier in the game. 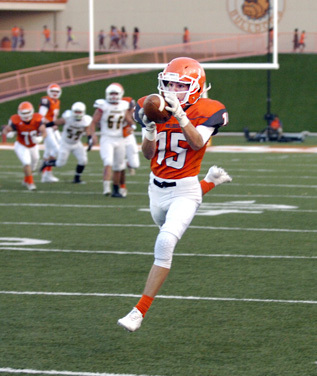 Artesia answered Hobbs’ second-half-opening TD with a 31-yard scoring pass from Null to JR Bustamante and would respond immediately to the Eagles’ next TD – a 21-yard pass from Hardison to Semaj Cotton – as well on a one-yard push by Robert Fernandez with 38 seconds left in the third. Hobbs’ final touchdown of the night – a 17-yard pass from Hardison to Cotton as the fourth quarter commenced – looked once again as though it might be the proverbial nail, but those who took it as impetus to exit stage right missed an exciting finish, if not an altered outcome. A 39-yard pass from Null to Jacob Orona quickly gave the ‘Dogs first and goal, and Hardt would tiptoe through the end zone with a five-yard catch from there to make it 56-42 with nine minutes remaining. A penalty on the kickoff gave the Eagles a short field, but on second down from the Artesia 32, junior DB Camren Saxon skied near the goal line to intercept Hardison’s next attempt and rumbled back to the Bulldog 37. The ‘Dogs were denied their first attempt at making it a one-touchdown game when the ball was spotted two yards back from where Fernandez’s well-executed fourth-down lunge had landed it. The defense forced a quick three-and-out, however, and Null – despite starting from his own 20 – needed just one play, hitting Orona for an 80-yard score that trimmed the Eagles’ lead to 56-49 with 4:24 still to go. Having proven several times over the course of the contest that time management was no issue, all Artesia needed was a stop and a few seconds to work with. But unfortunately, it wasn’t to be. Hardison passed for four first downs and legged out a fifth in the game’s final series, converting once on third and long and once on fourth and nine to preserve the Eagles’ first victory over Artesia since 2014. “We’ve got a really young secondary, and I think they grew up a lot last night,” said Henderson. “We got to work on a lot of other things also. We got to run kickoff return, which we didn’t really the first week. We got to send the field goal team out, so we got some opportunities in the kicking game, as well, that’re going to help us. The Bulldogs finished with 602 yards of offense on the night to Hobbs’ 666. Null’s 493 passing yards put him third on the program’s all-time list for yards in a game, as the senior finished 31 of 43 with four touchdowns. Orona and Estrada led the receiving corps with 145 and 132 yards respectively and a touchdown apiece. Hardison was 40 of 54 for 573 yards for the Eagles, Finney and Cotton were 12-191 and 13-169 receiving respectively, and Kemp was eight for 62 rushing. The Bulldogs will now look to put their freshly-learned knowledge to good use Friday as they host the Jaguars of Valencia in the 2017 Homecoming game. The Jags are also 1-1 on the year, having topped Alamogordo 34-12 in their opener before falling to Albuquerque High 28-14 Friday.